The Milwaukee circulator streetcar is moving forward, but there is still confusion in the mind of many. We’ve covered the issue in the past, but this article attempts to bring everything together in one place, the history, the frequently asked questions, and the proposed route. 1991 – Milwaukee awarded $289 million for the construction of a dedicated-bus lane in the East-West Freeway corridor (Interstate 94 from Downtown to Waukesha). When the plan was canceled, the federal government took back $48 million. Then Gov. Tommy Thompson prevailed on Rep. Tom Petri (R) to allow Thompson to direct the transit funds to other transportation projects, including freeways, because Thompson wanted the money for the Marquette Interchange reconstruction. Intervention by then-Rep. Tom Barrett (D), and Sen. Herb Kohl, (D), prevented that outcome – – and I don’t recall then State Rep. Scott Walker, (R), piping up and complaining that would mean less money for Milwaukee County buses someday. 1999 – A deal between County Executive Tom Ament, Mayor John Norquist, and Governor Tommy Thompson and approved by the federal government diverts $149.5 million to a series projects that include the construction of the new Marquette Interchange, the 6th Street Viaduct, and Canal Street. The fund (which does not gain interest) is left with $91.5 million designed for capital costs of a downtown circulator starter system. To access the remaining funds, approval is needed from the Milwaukee Mayor, the Milwaukee County Executive, the President of the MMAC, and the CEO of the Wisconsin Center District (WCD). 2006 – The Milwaukee Common Council approves an electric-guided bus plan, backed by the MMAC and WCD, intending to move it into preliminary engineering. Mayor Tom Barrett vetos the $300 million proposal, the majority of the Common Council reverses their previous position and upholds the veto. Plan killed. Credit the Common Council for trying to do something on the issue, but the system was seriously flawed and I think that was realized at the end of the day. 2007-2008 – Tom Barrett and Scott Walker each pushed the issue of the $91.5 much more publicly. Barrett unveiled a plan that included a downtown streetcar loop and two express bus lines, and talked of reconfiguring existing bus service to work with new, express service. Walker unveiled an express bus plan scant on details, but complete with attacks on the Mayor’s plan. It appeared he had the intention to simply cut all standard bus service in the areas to be served by express buses. Both, being career politicians, cleverly avoided any mention of the money needed to operate such a system after building it. September 9th, 2008 – Tom Barrett and Scott Walker debate the merits of their respective proposals at a forum at Marquette moderated by Mike Gousha. Barrett offers to split the $91.5 million 50/50 in person to Walker (an idea he had been proposing for weeks if not months prior), Walker refuses. March 2009 – Senator Herb Kohl and Representative David Obey include an earmark provision in the bill that became the Omnibus Appropriations Act of 2009 that divided the $91.5 million between the City of Milwaukee and Milwaukee County. Milwaukee County received 40% ($36.6 million), with the City of Milwaukee receiving 60% ($54.9 million). Barrett and Walker are each now free to pursue using their respective allocated funds to build a new mode of transit service in Milwaukee. More details on the origin of the money, and past issues is available in an article on Milwaukee transit politics. Is the streetcar proposal part of the proposed Regional Transit Authority (RTA)? No, but in the future it could become part of the RTA. At this time no serious discussions have taken place between the City of Milwaukee and appointed-members of the RTA (outside of of course the Mayor’s appointee Sharon Robinson). The RTA is currently being debated in the Wisconsin State Senate and State Assembly after being included in the Governor’s budget proposal. It would allow the counties of Kenosha, Racine, and Milwaukee to enact a sales tax up to 0.5% to fund transit services (key aspect: it would not enact the sales tax as further action would be needed locally in each county). Does that streetcar affect the current transit funding crisis? No, the $91.5 million is not available for operating costs of MCTS. Nor, despite what Scott Walker advocates, does the implementation of a streetcar compete for funding against the existing transit system. The key to fixing the existing transit funding crisis is to obtain dedicated funding. Currently property tax dollars from the general fund of Milwaukee County are used. These are supplemented by dollars from the state. When this is not enough (as it not been numerous years in a row) federal dollars designated for capital expenses (new buses) have been used for operating expenses. This problem has been looming for years, and has been postponed with service cuts and fare hikes. Does the streetcar stand a better chance of being built with the RTA in place? Yes. The RTA would provide a dedicated funding source for transit in Kenosha, Racine, and Milwaukee counties. It could also serve as the operator of multiple services in place of MCTS and other existing services, this included the KRM commuter rail line and potentially the streetcar. The streetcar proposal currently has the majority of the funding needed for construction (capital costs), but not for the operating budget. The RTA is a logical fit for operation of the streetcar, especially since the proposed route would sync with the RTA-proposed KRM commuter rail line at the Milwaukee Intermodal Station. The RTA is likewise a good choice for the operator of the region’s bus transit services as centralized branding, route planning, and uniform ticketing will lead to the attractive and cost-effective intermodal transit system. Where would the streetcar run? On steel rails embedded in the road in the same lane as traffic runs on. The rails would not damage cars or cause a bumpy driving experience. Unfortunately for road bikers, narrow tires may get stuck in the space between the rail and the road, but there isn’t a shortage of streets in downtown Milwaukee that bikers can utilize. 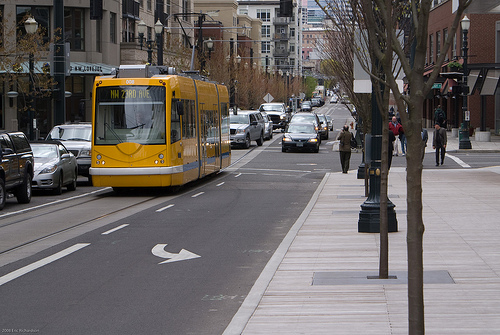 Portland, perhaps the most bike friendly city in America, has avoided this problem by dedicating space for bike lanes or having bike lanes intersect streetcar tracks perpendicularly. The streetcar would also have signal priority, so it won’t get stuck at stop lights. An example image from Portland is included below. Would the streetcar eliminate street parking where it runs? Rarely. Depending on the configuration of the street and the location of the stops minimal parking would be lost. Using the same space for stops as the existing buses do would save stalls (and make logical transferring points) will reduce the need to eliminate parking. Additionally, using streets that don’t have much street parking on them to start (such as Van Buren Street south of Juneau) will make the loss of parking minimal. 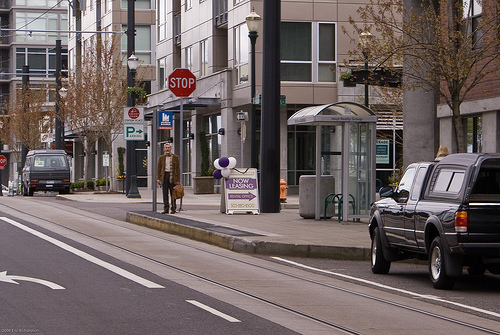 An example image of how a streetcar stop may function is included below, remember that the spot is already “unparkable” as it is a bus stop. What’s the difference between a streetcar system and a light rail system? There is a three-fold difference between streetcars and light rail. The first is the intended users, streetcars work within a handful of densely populated neighborhoods circulating people (light rail connects location at least a couple miles apart (downtown to the airport, UWM, or Miller Park, with maybe one stop inbetween each). The second difference is the type of track such a system would need, to go longer distances a light rail system a dedicated right-of-way is needed where no other vehicles can run. Longer travel distances also yields itself to bigger and longer trains, bigger trains mean bigger stations. Streetcars, as their name, indicates run in the street, with traffic and are much shorter (and smaller) than light rail vehicles. The third difference is the cost. Light rail costs more, at least $10 million more per mile, Tucson, AZ estimates light rail would cost $30 million more per mile than a streetcar (numbers will vary based on size of system, need for land acquisition, and road configuration). At the end of the day it’s an apples-to-oranges comparison though as they serve different purposes. More discussion on this issue can be found in a previous article on transit technologies. Why not a bus instead of a streetcar? Quality of the ride, and the chance of sparking investment. Riding on steel rails provides a very smooth ride, on top of having curb bump-outs at stops so there isn’t weaving in and out of traffic, and signal priority to avoid waiting at stop lights. Second, investing in the steel rails in the ground has a great chance of sparking development nearby as has been shown in numerous other cities where modern streetcar systems have been built. It’s a show of confidence that a bus can’t deliver. There is also an unfortunate reality that there is a stigma attached to standard bus service, and that people will ride the streetcar that would rarely, if ever, ride a standard bus. False. The 78,000 or so people that work downtown along with the 15,000 that live downtown are likely riders. That’s before entertainment is considered, to which the streetcar would enable people to avoid paying for parking next to the Bradley Center or other venues and park in other areas of downtown. It would be a boost to downtown businesses, as it would encourage people to move about the area after parking. Current MCTS riders would also have their ability to move about the downtown extended, which might allow some to take a bus downtown and the streetcar to their ultimate destination (or save someone currently taking a long walk). Riders of the future KRM commuter rail line will be able to get off at the station and ride the streetcar to their ultimate destination. The last and final obvious group of potential riders is tourists, who stay at all the various hotels around downtown or drive into downtown to the convention center and currently don’t go elsewhere in the city. Why Only 3 Miles In Length? Money, money and politics. The federal money was donated to create a starter system. At a cost between $18-$30 million per mile, three miles would keep the cost below $100 million and provide a starter system with obvious routes to UWM, the west, and the airport as potential future extensions. Looking at various routes, also yields the reality that three miles is about as short as one can go before the system doesn’t connect anything. It won’t be easy for the city to obtain the remaining money to build the system, but it won’t be impossible either. To put it in perspective, the final cost of Miller Park is four times that of the streetcar proposal. Still, it’s a lot to swallow politically, so as Barrett says “it’s the goldie locks plans, not too big, not too small, just right.” If you disagree, run for Mayor or County Executive, just don’t be surprised when you get laughed out of the room. Who is going to pay for the rest of the capital costs? The portion the city received for the streetcar from the $91.5 million was $54.9 million, which is a significant amount, but not enough to cover the costs of Tom Barrett’s proposal. That leaves options to fund the remainder. The likely funding option is that the city bonds the money to build it, and it is paid back through the general property tax fund. Another possiblity is that a benefactor or two could fund the system. Michael Cudahy has been an outspoken advocate of a streetcar system, flying Walker and Barrett around the country (and to Ireland) to look at different systems. He had mentioned funding the capital costs for his own route, so there is an outside chance Barrett could convince him to fund some portion of the ultimate route. Using the RTA’s potential bonding ability (as derived from its sales tax collections) is extremely unlikely, but is technically a possibility. Theoretically one could also put together a series of tax-incremental financing districts to pay for the capital costs, but that would hamper the city’s ability to collect the increased property tax revenue that the line would generate through transit-oriented development. We held a contest seeking out the best possible three-mile streetcar route, and a clear winner emerged. We’ve included that route below as the Mayor’s route isn’t final until there are rails in the ground. Is there any chance for the winning streetcar route to be constructed instead of Barrett’s plan? Both seem good, but the winning plan seems to have more practical purposes. Is there any way to alert the mayor and council about this plan? @Martin I’d say at this point in time anything is possible. Fund this thing, both construction and operation, with private money instead of taxes (either through fares or your good buddy Cudahy) and I’ll support it. Is the winning route actually the same in length as the mayor’s? It looks to cover more miles. If they are in fact the same in length, it clearly is more superior as it covers more terrain and would be more useful than just a loop around the central downtown. I believe the winning route is about the same length as the Mayor’s proposal. PS Matthew I’m in for a yearly pass! I think the mayors route was 3 track miles long while the winning route was 3 miles of double tracks. Thanks for the info, Matthew. Does this mean that this is an apples to apples comparison then? Or more appropriately, does the start up money cover for laying double track for 3 miles or only laying single track for 3 miles? I really do like this route compared to the mayors. As a Third Ward resident and downtown worker I could really see using this – get to grocery stores, beach, theater, Brady Street all with ease. I’m afraid if a less useful option gets built the ridership numbers won’t be there out of the gate which will fuel the masses that were against this project from the start. Let’s hope our mayor is open to reviewing other route options. This is so past due!! Let’s get this built. I can’t wait to not have to rely on my car to get around town. Milwaukee needs to join the cities that are being forward focused and implementing light rail. Chicago has a Central Loop through their downtown, and it seems to be working for them. @DAN True… and for me personally the loop would actually hit a lot of places that I might go….. If the major benefit of fixed route transit is going to be new development/value creation the route needs to have a better balance between current traffic generators (MU/hotels/offices) and emerging markets (the brewery, park east, adjacent neighborhoods). From my understanding of the machinations at City Hall; the idea of the loop was to build something that could be achieved without taking a major political risk or fighting the NIMBY factor. A Farwell route toward UWM is an example of an area loaded with political dynamite, the condo crowd gets absolutely unruly when any discussion arises about altering parking or traffic patterns on Farwell or Prospect. D’Amato had a political aversion to any route proposals up Downer because of strong opposition voiced years ago when Downtown to UWM rail links were first studied. Some people’s views have changed over time, particular property developers and small business owners, as they examine the financial rewords being reaped in cities that have built systems. In DC, the Georgetown area apposed a Metro stop for many of the fear-mongering reasons given by rail opponents here (i.e. it brings in the “wrong element”), now many Georgetown residents and businesses view that historic decision with regret. So the downtown loop is a political compromise, but at least it is a start … in general national attitudes are shifting in favor building multimodal systems and this is a good thing; the loop will help accelerate the change in attitude. The pattern in other cities is that empty shops and lots tend to fill up near transit stations and along trolley routes. These routes attract transit oriented development, and increase the density and value of the neighborhoods they traverse and are embedded in. They do this because a societal demand exists for vibrant, walkable, urban areas. These areas attract entrepreneurs, creative types, free thinkers, and the colorful spectrum of people that tend to occupy dynamic urban scenes. This tends to be a liberal, open and creative society, which tends to garner hostility from those who are threatened by this sort of urbanity. The logic of the Cato Institute and Reason Foundation fellows, who paint rail transit as an oppressive liberal conspiracy to destroy the American Dream, defies rationality. A demand exists for the aforementioned urban lifestyle. Build a line or transit station and the developers, like good capitalists they are, infill to meet the demand. Contrast this to the inverted causality used in some anti-transit arguments including locals; the causally inverted illogic that the natural density created near transit in response to the pent up demand must be some sort of liberal social engineering conspiracy. Public transit, especial rail based public transit, uses less natural resources to move people while using less human labor to operate it and maintain it. It is inherently economically superior to a transportation model based on individuals having a quarter ton personal device that spews tons of carbon in the atmosphere, requires acres of dedicated land to be paved, eats up a large percentage of personal income and is thrown away every eight years. Expressways and suburban sprawl are part of an incredibly inefficient and resource wasting lifestyle. Automobiles are a great conduit for channeling the peoples’ money to oil companies, road contractors, and automobile manufacturers. Our society has been brainwashed into seeing automobile dependency as freedom, when in fact it is a drain on our resources and wealth. People who live in walkable urban areas well served by public transit, not only have a lower carbon footprint, they have more money to spend at the local restaurant, food market, theater, or small business. Our economic self interests and our long term interests are both served by building rail transit. Milwaukee needs to get with it. It is time to start. If the loop is it, then let’s start building the loop. Lay the rail, put up the overhead wire, let’s go! Great, informative article summarizing the history of this project. I think that people interested in seeing a logically superior alternative route like the one above shouldn’t just *hope* that Barrett “sees the light” and rethinks his position. Politics, as Joe points out, is driven by interests which tend to be dominated by developers and others with financial/political clout. For the minds and actions of decision-makers to be changed, citizens and business owners interested seeing this effort truly succeed need to bring their (our) interests to bear. There are many that could benefit from the proposed alternative route–business owners on the route, citizens that work downtown and live on the Eastside, etc.–that, once informed, could unify to tip the scales. There’s a lot at stake here and I’d be interested in working with others to talk through ways that we, as Milwaukee’s citizens, could advocate for more promising route/design alternatives. It’s encouraging to see that others (those responding to this post) are interested in this issue…I think there are many more who would be as well if they understood the issue better. It would make sense to take the three miles of track that will probably become available and stretch across the landscape a bit more. With a guideway that enters into numerous neighborhoods, the tram could actually hit more of a population, obviously. I propose a tram from Marquette to UWMke via Wisconsin Ave. and Prospect/Farwell. I was born and raised on the southwest side of Milwaukee. I have lived in Chicago and experienced it’s transit system. I currently live in Nashville, TN where a transit system is nearly null and void, at best. I remember being able to get around Milwaukee by bus, as a kid, to virtually anywhere in the city with ease. It is very disturbing to read about your local politicians debate/argue needlessly about the benefits and/or disadvantages of a modern rail/transit system when they should be spending the majority of their time educating it’s citizens to the numerous benefits of mass transit. I see the problem being two-fold. Many of Milwaukee’s “issues” with transit doesn’t always fall within it’s city politicians. The problem largely exists within the residents of Milwaukee. I visit home (Alverno neighborhood) often. My last visit involved a lengthy discussion with my Mother about the proposed rail project for Milwaukee. My Mother’s FIRST response was, “I don’t want to pay for a service I won’t be using”…A simple, straight to the point, south-sider answer. She isn’t alone. The population uninformed about the long-term benefits of mass-transit, like my Mother, is probably staggering in the city of Milwaukee. She doesn’t want another property-tax increase. And let’s face it, Wisconsin is known for high taxes, so I don’t blame her. But along with not being educated about the benefits of mass transit, and the resentment for increased property taxes to fund the project, comes a negative attitude towards progress. Many in Milwaukee, like my Mother, feel that progress is negative…”white-collar”…or even snobbish. Change is bad, and progress is even worse. My point is simply this…Building a new transit system in Milwaukee, raising funds, and dealing with local Politicians are the small issues to solve. Getting through the minds of many, (and I mean many!!! ), Milwaukee anti-progress, blue-collar, change is bad citizens, is even more challenging! The citizens, like my Mother, don’t care about the policitcal bickering or how a modern rail system can make Milwaukee appear more appealing nationally. Show them the benefits of mass-transit. Give them a reason to support your agenda. Show these people how mass-transit will ultimately, in the long run, lower taxes. Show how transit can reduce emissions, and eliminate billion-dollar interstate/highway projects. Educate these frugal people how transit will generate new businesses, which will in turn generate new tax revenues for Milwaukee that can ultimately slow the increase of property taxes!